From the United States to Europe, the “migrant crisis” is causing bitter interior and international controversy about the policies which need to be adopted concerning the migrant flow. However, these movements are being represented by a cliché which is the opposite of reality – that of the “rich countries” obliged to suffer the growing migratory pressure of the “poor countries”. This misrepresentation hides its basic cause - the world economic system which enables a restricted minority to accumulate wealth at the expense of the growing majority, by impoverishing them and thus provoking forced emigration. As concerns the migrant flow towards the United States, the case of Mexico is emblematic. Its agricultural production collapsed when, with the NAFTA (North American Free Trade Agreement ), the USA and Canada flooded the Mexican market with low-cost agricultural products, thanks to their own public subsidies. Millions of agricultural workers found themselves without jobs, thereby increasing the work pool recruited by the “maquiladoras” - thousands of industrial establishments along the frontier, in Mexican territory, possessed or controlled, for the most part, by United States companies, where salaries are very low and trade union rights inexistent. In a country where approximately half of the population lives in poverty, this situation has increased the mass of people who want to enter the United States. This is the origin of the Wall along the border with Mexico, which was begun by the Democrat President Clinton in 1994 when the NAFTA came into effect, pursued by the Republican Bush, reinforced by the Democrat Obama, the same wall that the Republican Trump now hopes to complete along all 3,000 kilometres of the border. Concerning the migratory flow towards Europe, the case of Africa is emblematic. The continent is rich in raw materials – gold, platinum, diamonds, uranium, coltan (or tantalite), copper, oil, natural gas, precious woods, cocoa, coffee and many others. These resources, once exploited by the old European colonialist system with slave-type methods, are today being exploited by European neo-colonialism in collaboration with the African elites in power, a low-cost local work force, and interior and international control of the market-place. More than one hundred companies listed at the London Stock Exchange, British and others, exploit the mineral resources of 37 sub-Saharan African countries for a value of more than 1,000 billion dollars. France controls the monetary system of 14 African ex-colonies via the CFA Franc (originally the acronym of the “Colonies Françaises d’Afrique”, now recycled as “Communauté Financière Africaine”). In order to conserve parity with the Euro, these 14 African countries are obliged to pay the French Treasury half of their monetary reserves. The Libyan state, which sought to create an autonomous African currency, was demolished by the war of 2011. In the Ivory Coast (a CFA region), French companies control the greater part of the commercialisation of cocoa, of which the country is the world’s top producer – the little producers are left with hardly 5% of the value of the end product, such that most of them live in poverty. These are only a few examples of the neo-colonial exploitation of the continent. Africa, presented as being dependent on foreign aid, in fact pays foreign countries a net annual forfeit of about 58 billion dollars. The social consequences are devastating. In sub-Saharan Africa, where the population is greater than one billion souls, and is composed of 60% children and young people between the ages of 0 and 24 years old, about two thirds of the inhabitants live in poverty and amongst these, about 40% - which is to say 400 million – live in conditions of extreme poverty. 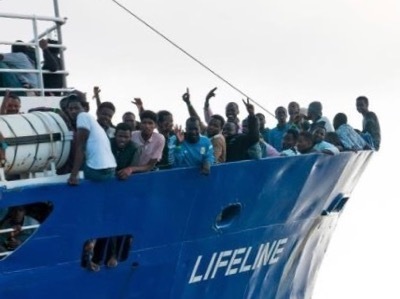 The “migrant crisis” is in reality the crisis of an unsustainable economic and social system. With the end of the Cold War has come an upsurge in humanitarian interventions-military campaigns aimed at ending mass atrocities. These wars of rescue, waged in the name of ostensibly universal norms of human rights and legal principles, rest on the premise that a genuine "international community" has begun to emerge and has reached consensus on a procedure for eradicating mass killings. 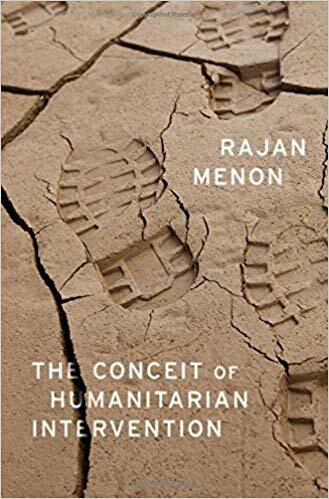 Rajan Menon argues that, in fact, humanitarian intervention remains deeply divisive as a concept and as a policy, and is flawed besides. The advocates of humanitarian intervention have produced a mountain of writings to support their claim that human rights precepts now exert an unprecedented influence on states' foreign policies and that we can therefore anticipate a comprehensive solution to mass atrocities. In The Conceit of Humanitarian Intervention, Menon shows that this belief, while noble, is naïve. States continue to act principally based on what they regard at any given time as their national interests. Delivering strangers from oppression ranks low on their list of priorities. Indeed, even democratic states routinely embrace governments that trample the human rights values on which the humanitarian intervention enterprise rests. States' ethical commitment to waging war to end atrocities remains episodic and erratic-more rhetorical than real. And when these missions are undertaken, the strategies and means used invariably produce perverse, even dangerous results. This, in no small measure, stems from the hubris of leaders-and the acolytes of humanitarian intervention-who have come to believe that they possesses the wisdom and wherewithal to bestow freedom and stability upon societies about which they know little. Seventy five journalists working in Syria in the “rebel” regions have called on Israel to help them. Their request is to be able to cross the border and then to be evacuated to Europe. We do not know for sure the names of these “journalists” but we do know that, general speaking, they are not fighters. They have covered the events and are giving credence to the various allegations of crime committed by the Syrian Arab Republic, including the use of chemical weapons. While initially several of these journalists were on the pay rolls of TV news channels such as Al-Arabiya, the BBC, Al-Jazeera, France24 and Sky, today the word on the street is that there is no longer a demand for their services among international media. The British MI6 had put in place correspondents tasked with providing “images” and “witnesses” to the Western press. With an annual budget of 3 million euro per year, more recently this group has been presented as seeking to fight Daesh. Yet in actual fact, it had been conceived, right from the start of the aggression against Syria, to justify the war against the Arab Syrian Republic. “How Britain funds the ’propaganda war’ against Isis in Syria”, Ian Cobain, Alice Ross, Rob Evans, Mona Mahmood, The Guardian, May 3rd, 2016. “The techniques of modern military propaganda”, by Thierry Meyssan, Translation Pete Kimberley, Voltaire Network, 18 May 2016. TEL AVIV (Sputnik) - Israel has evacuated members of the White Helmets and their families from Syria at the request of the United States, Canada and European countries, Israeli Foreign Ministry spokesman Emmanuel Nahshon said on Sunday. "Upon request of the US, Canada and European states Israel has completed a humanitarian effort to rescue members of a Syrian civil organization ('White Helmets') and families. They were evacuated from the war zone in southern Syria to a neighboring country," Nahshon said on Twitter. The Israeli Defense Forces (IDF) earlier said that they had evacuated members of an unnamed local civil organization from southern Syria. According to the IDF, people were evacuated from the war zone in Syria's south due to an "immediate threat to their lives" and then transferred to a neighboring country. Separately, German newspaper Bild reported that Israel had evacuated nearly 800 personnel and families of the White Helmets from the southwest of Syria to Jordan, where they would later be transported to Great Britain, Canada and Germany. On Monday, CNN reported, citing sources, that the evacuation of about 1,000 White Helmets and their families from Syria had been discussed during the NATO summit last week amid the progress the Syrian government is making in regaining control over the rebel-controlled regions. The White Helmets volunteer group considers itself a non-governmental organization aimed at protecting Syrian civilians. However, Syria's President Bashar Assad says that the group is affiliated with the al-Qaeda terrorist organization.